This fly is tasty! With it's pearly body for subtle flash, and a rabbit fur wing for action, the Bonefish Scampi is simplicity itself - this fly has all of the things we look for in a productive bonefish pattern. 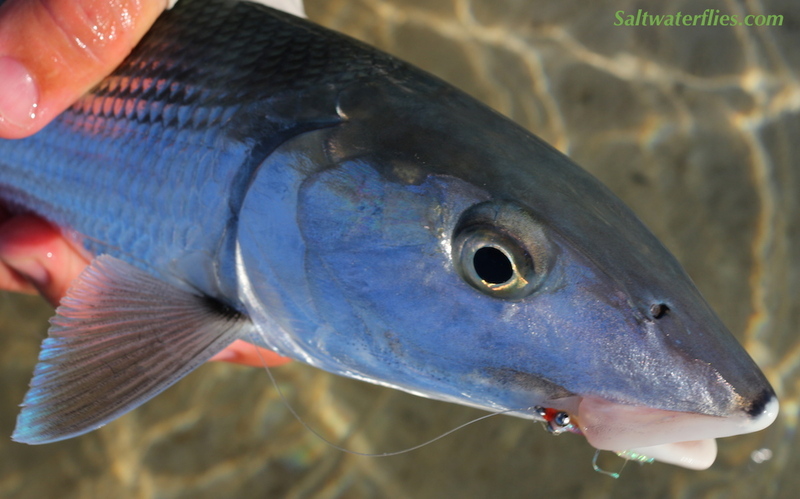 Having bonefish flies in a variety of weights helps anglers cover all water conditions, and this fly is tied in two versions - one with lead eyes (heavier weight) or bead chain eyes (lighter weight) to help anglers keep the fly right in the strike zone. This fly in the Lead Eye is also a nice imitation of a Mole Crab for surf perch, croakers, flounders, etc. Recently added is the "Banded Scampi" shown above (click photo to see side view) - see below for the original Bonefish Scampi. 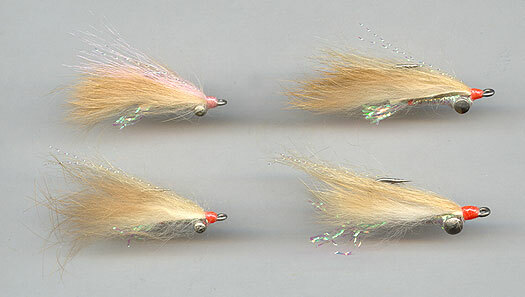 along with just a bit of pink fur dressing on top of the fly - otherwise these are all essentially tan colored flies. 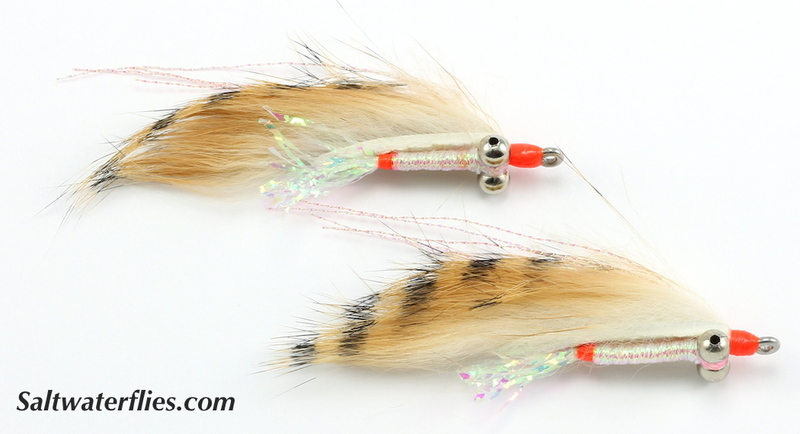 Bonefish Scampi with bead chain eyes; Pink is on the top and Tan is on the bottom. The two flies on the right hand side are the lead eye version in the Tan color. 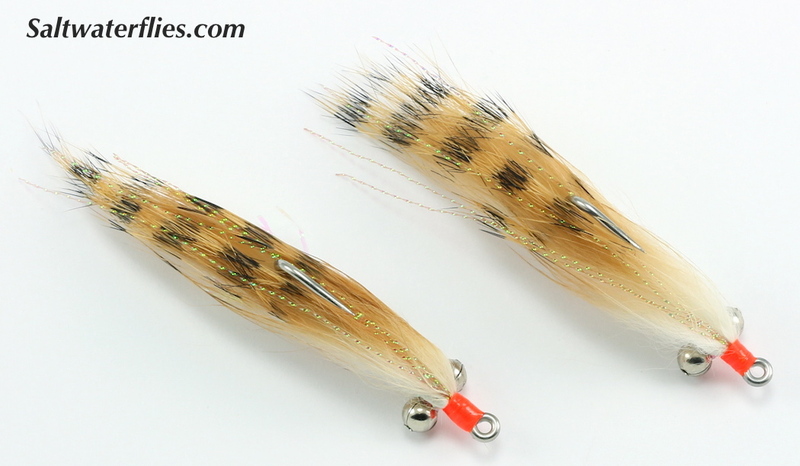 The Bonefish Scampi fly design is by Henry Cowen - tied by Umpqua Feather Merchants. Similar patterns: Gotcha / Bunny Gotcha etc, Christmas Island Special.